If you follow my Facebook page then you probably noticed I got 'trolled' this week. 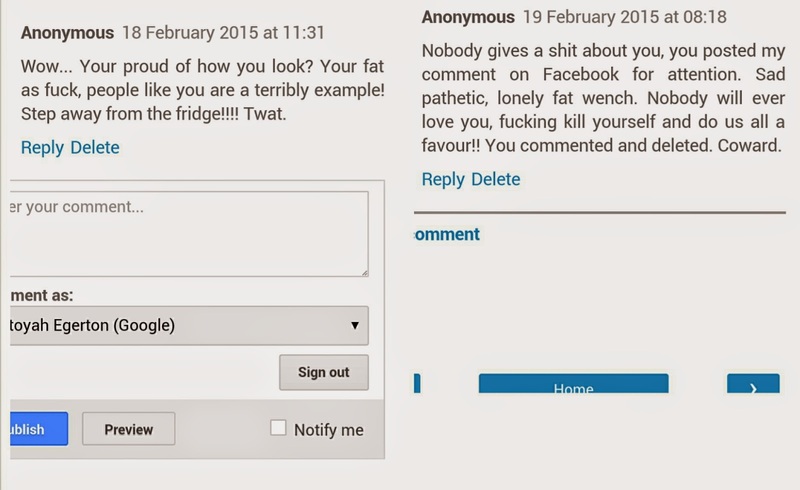 Someone made comments directly on my blog page- anonymously. I shared these on Facebook and it provoked such a response from all of you, I was overwhelmed at all of the support. Something became really clear in the hundreds of comments posted. This wasn't the first time anyone had seen something like this happen. Trolling now seems to be a common, normal thing that we must get used to and deal with accordingly. Some suggested contacting the police, others suggested ignoring it and made assumptions about the sad life the anonymous poster has. It could be someone I know, but the likelihood is that it is a total stranger. "Bullying" is a term that is over used nowadays, in my opinion. For pretty much my entire school life I was bullied. Kids can be so cruel, picking up on any slight difference and being as mean and vile as possible. I had a lazy eye, was slightly overweight, called Latoyah and liked to sing. This all sounds normal, but to the kids at school it was all the ammunition they needed- "La-toilet-seat" which quickly turned in "Latoyah pissed herself", that stuck forever. There was always the fat comments and "are you looking at me or looking over there, wonky eyes!". I had a small group of friends and when I moved up to secondary school I thought I could rely on them. Some of them actually turned against me and joined in with the crowd (something they have apologised for since) and at times I just felt so alone. As I got older it got worse and I experienced violence, but to me it was always the words that hurt more. I used to dread lunchtimes, and sometimes I locked myself in the toilet cubical on my own to eat my lunch, just to hide away. School was the most miserable time of my life, but that experience made me who I am today. I suffered in silence for a long time until one day I broke down and told my parents, they went to the school and things did eventually get better. The worst part is that in adult life I have bumped into a few of the people who used to pick on me and challenged them on it- they didn't even remember. Something that is so prominent in my mind, and a massive part of my childhood that I will never be able to forget, means nothing to them - and why would it? It was just a bit of a laugh for them. I can't imagine how bad my time at school would have been if social media was as big as it is now! The digital age has introduced a whole new platform for nastiness, and it was only a matter of time before I got some kind of negativity. The particular post that the comments were on had a before/during picture of my weight loss journey- something I debated long and hard about posting. It is something very personal and after much debating I decided that if it can inspire just 1 person, it would be worth it. These comments did not upset me in any way. I didn't reply, I just deleted the comments and shared the screenshots on Facebook to laugh at the idiocy of it all. I am actually quite flattered that someone has taken the time to comment on something I wrote, not once, but twice. That's a few minutes of their life that they've spent on me that they can never get back! They also spent time checking my Facebook page, so they are pretty dedicated to their cause. I will not be reporting anything to the police, they have much better things to do with their time than go after everyone who has ever been nasty on the internet! 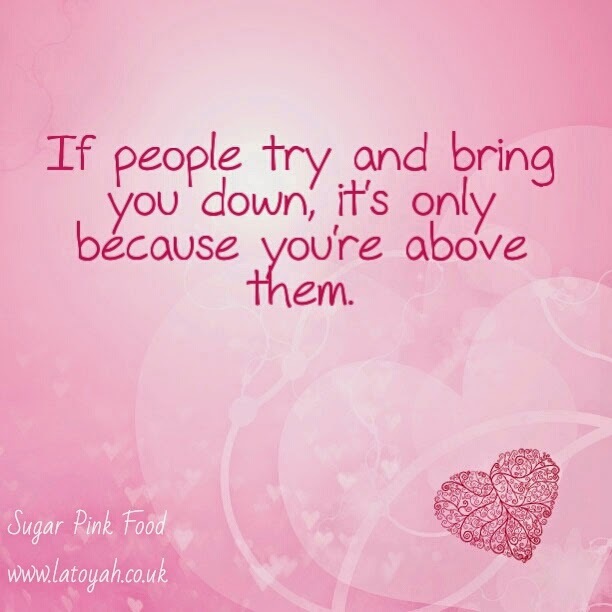 If I spent less time worrying and feeling downtrodden about the bullies in school I would have enjoyed my time more. So what if someone thinks I am fat, ugly, stupid or anything else; it should have no affect on my life. My blog is my personal space and I won't let anyone be intentionally mean on it. If they have an issue with me then the least they could do is post using their real name- using anonymity really is cowardly. Life is too short to waste time being mean to people on the internet, or in real life and if someone has been mean to you, life is too short to spend time worrying about it.